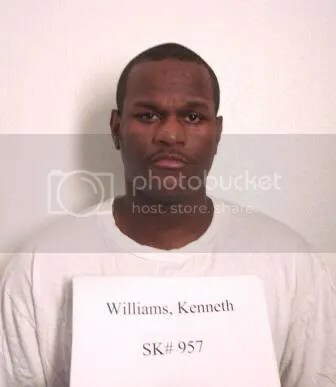 Kenneth D. Williams was executed at 11:05 pm in Grady, Arkansas on April 27, 2017. In this post I want to take a short look at Adrian Rogers’ sermon THE BIBLE AND CAPITAL PUNISHMENT and then look at the life of Kenneth D. Williams and a close look at the peace that passeth all understanding that is available to anyone who puts their faith in Christ. There are four reasons why capital punishment is necessary. FIRST, to obey God. (Genesis 9:6). SECOND, to protect society. Romans 12:9 says, “Love is to be sincere and active [the real thing—without guile and hypocrisy]. Hate what is evil [detest all ungodliness, do not tolerate wickedness]; hold on tightly to what is good.” Much today is called LOVE but has no resemblance to TRUE LOVE. Because God loves us, He doesn’t want us raped or murdered and He has put something in place to stop it. Softness to the criminal is cruelty to the community. THIRD, for the good of the criminals. The death penalty should also be practiced for the welfare of the criminals….When the principle of restraint is taken away, you have not served the criminal. You have been cruel to him because he does not realize the judgment that should come to him. The death sentence in a sense is a kindness to him because it reminds him that there is a God of justice that he must face. IF A MAN HAS COMMITTED A CAPITAL CRIME AND HE KNOWS THAT HE IS GOING TO DIE FOR THAT CRIME, IT MAY BRING HIM TO REPENTANCE. Many of those who are executed go into the chamber saying that they have repented and have accepted Christ as their personal savior. They know that in a short while they are going to face almighty God. The Bible says that the government’s authority is there for good and there should be terror in the hearts and minds of evil doers. If we transgress, we ought to be afraid. FOURTH, another reason for the death penalty is because of the justice of God. God is a holy God. There is sin and retribution. The death of Jesus was capital punishment. Our sin deserved death, and He took our death for us. Jesus actually bore the wrath of God against sin on the cross. Let us see if what Adrian Rogers said has any validity in the experience here in Arkansas. An inmate sentenced to death for a killing committed during a 1999 escape from a sentence for an earlier slaying has confessed to yet another killing in a letter to the editor of the Pine Bluff Commercial. Along with a man killed in a traffic accident in Missouri during inmate Kenneth D. Williams’ 1999 escape, the slaying to which he has now confessed would make him responsible for the deaths of four people. Williams, 26, says in a 512-page letter to the newspaper that he shot and killed Jerrell Jenkins, 36, of Pine Bluff on Dec. 13, 1998, the same day that he fatally shot Dominique Hurd, a cheerleader at the University of Arkansas at Pine Bluff. Police had listed Jenkins’ death as unsolved. “I take full responsibility for my actions and whatever consequences my peers see fit,” Williams wrote. Williams said he was a born-again Christian and wanted to confess his sins. 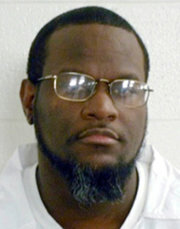 Death row inmate Kenneth Williams of Pine Bluff was executed Thursday night at the Cummins Unit for the 1999 murder of Grady resident Cecil Boren. Williams, 38, was pronounced dead at 11:05 p.m.
Williams was responsible for the deaths of four people in total and was sentenced to life in prison after he kidnapped and fatally shot 19-year-old University of Arkansas at Pine Bluff student Dominique Hurd in 1998. He was sentenced to death after escaping the Department of Correction’s Cummins Unit in 1999 and murdering Boren, 57, a former assistant warden at the unit. Williams was captured only after causing a fatal auto collision with water-delivery driver Michael Greenwood, 24, in southern Missouri. In 2005 letter to the Commercial, Williams admitted to murdering Jerrell Jenkins, 36, in Pine Bluff on the same day he killed Hurd. Greenwood’s widow and daughter bought plane tickets for Williams’ daughter and granddaughter to visit the prison before his scheduled execution. Williams credited the mother of Hurd and the daughter of Michael Greenwood with planting the seed so he could become a born-again Christian. The Rev. Dewitt Hill, pastor of First Trinity Church of God in Pine Bluff, said he received a letter from Williams on Wednesday. In the letter, Williams wrote that he felt the execution was not going to happen, according to Hill, but if it did he was at peace. Williams wrote that he felt he was able to convert “most of the people on death row to God,” Hill said, adding that Williams had become a “student” of the Bible. Boren’s niece, Terri Grimes, who attended Williams’ trial for the killing of her uncle, said she saw little remorse in him during that time. On the eve of my scheduled April 27th execution, the Light burned brighter than I’ve ever Known it to! Only once before did it blind me so. It first happened in 1999. I was the twenty year old defendant in a capital murder case where the death penalty was rolled out against me. Mrs. Williams (No relation to me), the mother of the late 19-year-old Dominique Hurd, whom I senselessly murdered, took the stand having suffered great loss, and she shared these words, “I forgive Kenneth Williams. My daughter, Dominique ‘Nikki’ Hurd, was a forgiven person.” She said, ”I do not wish for him to be put to death. His death won’t bring my daughter back.” She went on to say, ”I pray that before Kenneth Williams leaves this world he will give his heart to Jesus.” On the other hand, yet not without understanding, the father of Dominique was full of indignation. He wanted me to feel his pain. Pain was my Language. It was my thing. But what I couldn’t comprehend; what could not be reconciled in my mind, was this woman’s pure act of grace, Love, mercy, and forgiveness. For someone who had taken away her child from her in the worst of ways. LIFELONG BOND: Kayla Greenwood (right) and Jasmine Johnson at Arkansas prison Wednesday for Johnson’s meeting with her father, Death Row inmate Kenneth Williams. That marvelous light that shined forth that day out of Mrs. Williams acted as a planted seed into the soil of my life. Years later it would yield something special and God-bred. And when I could not think such a greater act of kindness, Love, and forgiveness could be expressed, I stood corrected. Thanks to Kayla Greenwood. She’s the daughter of the late Michael Greenwood, a man whose death I caused. His daughter, Kayla Greenwood, was just a child when her father was taken in a car wreck caused by me after I escaped prison. I was serving a life without sentence for killing Dominique. After 17 years of imprisonment and being on death row for also killing Cecil Boren during my escape, away from my own now 21-year-old daughter and never having seen before granddaughter, my death sentence finally had an April 27th date. A wish that burned within me was to see again my child and grandchild, possibly for the final time; first and last time. It had been over 17 years since I last saw my four-year-old child. The word got out about my desire. The last person(s) I would have ever thought it possible answered my call. Kayla Greenwood, the daughter of the late Michael Greenwood, and her family reached out to prison officials. Kayla said, “I would like to speak with him on good terms and put closure between us and let him know my family and I forgive him. I would also like to pay for his daughter and granddaughter to go see him and want to figure out how I can get in contact with her to make it happen. I am not looking for anything else but closure and giving his daughter and granddaughter a chance I don’t get because I know how important it is.” Not only had this family forgiven me, which would have been going the extra mile, but within a short period of time they paid and arranged for my baby and grand babe to come to Arkansas from the West Coast to visit with me, which included picking them up from the airport and driving them to the prison over 40 miles away. We had the most amazing and heart-felt visit that left a former cold-blooded killer in tears of gratitude. Had officials permitted it, Kayla and I would have met with no objections from me. My heart has never known a greater deal of respect and admiration for another human being than for Kayla and her family, and Mrs. Williams, the mother of Dominique Hurd. I will also include my daughter Jasmine and son Marqevion for forgiving me for my abandonment and any shame I may have brought upon them because of my wrongs. If tomorrow be my last day here on earth, then Mrs. Williams’ prayer she made at my trial that I GIVE MY LIFE TO JESUS before I leave this world, would be answered. I have been forever changed, forever grateful because of ”Extreme Grace Unmerited.” Amen. 1 Brethren, my heart’s desire and prayer to God for Israel is, that they might be saved. 2 For I bear them record that they have a zeal of God, but not according to knowledge. 3 For they being ignorant of God’s righteousness, and going about to establish their own righteousness, have not submitted themselves unto the righteousness of God. 4 For Christ is the end of the law for righteousness to every one that believeth. 5 For Moses describeth the righteousness which is of the law, That the man which doeth those things shall live by them. 6 But the righteousness which is of faith speaketh on this wise, Say not in thine heart, Who shall ascend into heaven? that is, to bring Christ down from above: 7 Or, Who shall descend into the deep? that is, to bring up Christ again from the dead. 8 But what saith it? The word is nigh thee, even in thy mouth, and in thy heart: that is, the word of faith, which we preach; 9 That if thou shalt confess with thy mouth the Lord Jesus, and shalt believe in thine heart that God hath raised Him from the dead, thou shalt be saved. 10 For with the heart man believeth unto righteousness; and with the mouth confession is made unto salvation. When a person tries to be righteous by keeping the Ten Commandments or by doing good deeds, God rejects that. Why would God do that? Because God is holy and man is sinful at his best. The best that we can do is not enough. We don’t have what it takes to keep the Ten Commandments in our own strength. If you’re hanging over a fire by a chain of ten links and nine of them are forged steel and one of them is made of paper, how safe are you? That’s the reason the Bible says if we should keep the whole law and yet offend in one point, we are guilty of all. God demands perfection and we just can’t supply it. Salvation is not a reward for the righteous; it is a gift for the guilty. Salvation is not a goal to be achieved; it is a gift to be received. Romans 1:17 says, “For therein is the righteousness of God revealed from faith to faith: as it is written, The just shall live by faith.” The only righteousness that is acceptable to God is a gift of faith through His Son Jesus Christ. You believe in who He says He is — the God made flesh who died and rose again for you to be reconciled to God. Then, you repent of your sins and confess Christ as Lord of your life. If Jesus is not the Lord of your life, then He is not your Savior. Salvation is not a cafeteria line where we say, “Well, I believe I’ll have a little Savior today, but no Lordship. Thank you.” No! Jesus is Lord. The only righteousness that God will accept is sinless perfection. And that was accomplished through His Son Jesus Christ. FRANCIS SCHAEFFER AND ADRIAN ROGERS ARE MY TWO SPIRITUAL HEROES BECAUSE THEY DEFENDED THE ACCURACY OF THE BIBLE! “Truth Tuesday” Is the Bible accurate or not? Adrian Rogers: Is capital punishment contrary to the word of God? Adrian Rogers – Does a Loving God Believe in Capital Punishment? Another great article by Adrian Rogers. Is capital punishment contrary to the word of God? Scripture tells us that human government is ordained and set up by God. It is very clear in Romans 13:1, “For there is no power but of God: and the powers that be are ordained of God.” And the powers that be are to act for God in the administration of human affairs. The government is ordained of God and one thing that the government does is to bear the sword. Look if you will in Rom. 13:4, “he beareth not the sword in vain.” He is talking about the instrument of death. Is capital punishment, therefore, ordained of God? May I say it is. Some have the idea that capital punishment would contradict the Ten Commandments. But it does not. Exodus 20:13 says, “Thou shalt not kill.” But Genesis 21:12 says, “He that smiteth a man so that he die, shall surely be put to death.” When the Bible says, “Thou shalt not kill,” it is literally translated, thou shalt do no murder. It does not mean that you should not execute a murderer. The Bible is quite clear on this point. We need to understand that the Bible does not forbid capital punishment. As a matter of fact, God has ordained capital punishment because He loves us. Romans 12:9 says, “Let love be without dissimulation.” That means real love is without hypocrisy. God is a god of love, but not of weak sentiment. God realizes there must be a restraint upon sin. Softness to the criminal is cruelty to the community. God loves people and because God loves people, God hates sin and God hates crime. God is too good not to punish crime. If God ceased to punish sin, God would cease to be holy. And God would cease to be good. Because God is love and because of the welfare of society, God has ordained capital punishment. I have written over and over and over about the arguments concerning raising the debt ceiling, and I have been waiting for this subject to come up again. It did on September 13, 2012. Here is a clip from Tim Griffin concerning the first debt ceiling vote back in the summer of 2011. Griffin did not join the 66 brave Republicans that stuck with the Tea Party and voted against the debt ceiling increase but he voted to increase it. The Bible talks about a lot of subjects and capital punishment is one of them. Greg Koukl has a radio show that I listen to on American Family Radio every Sunday afternoon. His grasp of these biblical issues is very good and I highly recommend his website www.str.org too. I have read hundreds of his articles and he knows what he is talking about. A. Capital punishment was commanded by God in the Old Testament. 1. It preceded the Mosaic Law. Gen 9:6 Whoever sheds man’s blood, by man his blood shall be shed, for in the image of God He made man. 2. It was based on the dignity of man, i.e. man’s transcendent value. 3. It was commanded in the Mosaic Law. a. Twenty-one different offenses called for the death penalty in the Old Testament. b. Only three include an actual or potential capital offense, by our standards. c. Six are for religious offenses. d. Ten are for various moral issues. e. Two relate to ceremonial issues. b. If God chose to set aside punishment, that doesn’t mean the punishment is unjust when it is executed. God was the one who required capital punishment in many instances. B. Capital punishment was assumed in the New Testament. b. Rom 13:1-2 Let every person be in subjection to the governing authorities. For there is no authority except from God, and those which exist are established by God. Therefore, he who resists authority has opposed the ordinance of God; and they who have opposed will receive condemnation upon themselves. c. 1 Pet 2:13-14 Submit yourselves for the Lord’s sake to every human institution, whether to a king as the one in authority, or to governors as sent by him for the punishment of evildoers and the praise of those who do right. 2. Those governments may practice capital punishment. a. Rom 13:3-4 For rulers are not a cause of fear for good behavior, but for evil. Do you want to have no fear of authority? Do what is good, and you will have praise from the same; for it is a minister of God to you for good. But if you do what is evil, be afraid; for it does not bear the sword for nothing; for it is a minister of God, an avenger who brings wrath upon the one who practices evil. b. Acts 25:11 If then I am a wrongdoer, and have committed anything worthy of death, I do not refuse to die; but if none of those things is true of which these men accuse me, no one can hand me over to them. I appeal to Caesar. C. Jesus’ ethic of love and forgiveness doesn’t disallow capital punishment. a. This argument proves too much. 1) It becomes an argument against any punishment what-so-ever. 2) What should we do with the criminal we’ve forgiven? a) Life in prison instead of capital punishment? b) But Jesus would forgive. b. Jesus never challenged the validity of the death penalty. 1) In Jn 8:3-11, for example, there were no witnesses left to testify against the woman caught in adultery (the Law required at least two witnesses). 2) Jesus actually upheld the Law here, He didn’t abrogate it, but He did so in a way that wouldn’t allow the evil designs of the Scribes and Pharisees to be accomplished. c. Jesus asked God to forgive, not Caesar; He didn’t suggest civil punishment or capital punishment was inappropriate. d. We must argue for the coherence and consistency of both Testaments. 2) We must also factor in Paul and Peter. a. I’m not sure what the point is here? Yes, Jesus was the victim of capital punishment, but what follows from that? b. The real issue regarding Jesus was not capital punishment, but His innocence. 1) Peter assails the act of handing over an innocent man to godless executioners. 3. But what about forgiveness? a. God’s mercy is always available in His court. b. Man’s court is another matter, governed by different biblical responsibilities. D. One simply can’t say that capital punishment is patently immoral on biblical grounds. He fulfilled it, but not in the sense that all laws are wiped from the books. Then we would have no punishment for any biblical crimes. Do not think that I came to abolish the Law or the Prophets; I did not come to abolish, but to fulfill. For truly I say to you, until heaven and earth pass away, not the smallest letter or stroke shall pass away from the Law, until all is accomplished. Whoever then annuls one of the least of these commandments, and so teaches others, shall be called least in the kingdom of heaven. A. Each position is based on a particular view of man. a. Man is man sick, needing healing. b. Man is a machine needing fixing. a. Man is a free moral agent who makes choices for which he can be held responsible for. b. Man is worthy of praise, resulting in reward, or blame, deserving punishment. 1. Man a free moral agent. a. He is capable of choosing good or bad behavior. b. He may be influenced by his environment, but not ultimately controlled by it. c. We have an immediate awareness of our moral natures, that we freely make moral choices. d. It seems to make sense to praise and reward good behavior. If we’re not responsible for our choices neither blame nor praise make any sense. 2. Crime is not pathological, deserving rehabilitation, but moral, deserving punishment. a. The goal of justice is penal, not remedial, moral, not therapeutic. 1) Justice demands punishment of the guilty. 2) Goodness demands protecting the innocent in society. a) “Capital punishment is to the whole society what self-defense is to the individual.” The Ethics of Life and Death J.P. Moreland, p. 115. 3. The punishment should fit the crime (lex talionis). 4. Capital punishment fits capital crimes (crimes that involve the loss of life). 1. Arguments that prove too much. a. Many arguments against capital punishment prove too much because they apply with equal force against any punishment at all. 1) Even if this were true, the injustice here applies to those that got away, not to those that got punished. It’s never unjust to punish a guilty man if the punishment itself fits the crime (lex talionis). The injustice is remedied by applying it more often, not less. 2) Better unequal justice than no justice at all. 3) If one man is paid for a job (he gets what he deserves) and another isn’t, how do you rectify the inequity? You don’t take away what the first man deserves, withholding his pay because the second man didn’t get paid. That would double the injustice. 1) This is a criticism of any system of justice, not a particular type of punishment. Life is flawed, not capital punishment. 2) Why must we accept a philosophy that says it’s better for 100 guilty people to go free than for one innocent person to be condemned? 3) Guilty people repeat crimes that injure and even kill other innocent people. 4) “But death can’t be undone.” No punishment can be undone. 5) Our attempts at improving justice here must be at the level of the process of adjudication making any determination of guilt more trustworthy. a. “How can you be for capital punishment but against abortion” (the “seamless garment” argument)? 1) The term “Pro-life” is actually a misnomer. Our case is not for every one’s life or every form of life. Pro-lifer’s are against the unjust taking of innocent human life, particularly the life of the unborn child. 2) The right to life is not an absolute; it can be forfeited. This moral right is only prima facie; it stands only until challenged by some greater law, like justice or protecting the lives of the innocent. 3) We also have a right to freedom, but it can be properly overridden with incarceration when certain conditions are met. 4) An unborn child has committed no crime that forfeits its life. 1) It’s not cruel and unusual, but rather the exact punishment that fits the crime. 2) This is an appeal to the language of the Bill of Rights, but the ones who wrote those words believed in capital punishment. If one wants to redefine the term for modern times, then he cannot argue from the Bill of Rights itself, because that has the old definition. 1) It always deters the offender. Dead people don’t commit more crimes. 2) If it lacks in deterrence, it might be because it is not widely exercised or not done speedily enough to be a threat. 3) The principal goal of capital punishment is not deterrence, but punishment. In that way it works every time. 1) Confuses a life sentence with a death sentence. 2) It’s unjust (doesn’t fit the crime) because the criminal only loses liberty, not life. 1) In one sense, all death is undignified. 2) Argues only against certain aggravated forms of capital punishment and not capital punishment itself. 3) In the final analysis, the question is not the dignity of death, but its equity or justice. f. “There’s no opportunity of to reform the criminal.” Justice is the goal of punishment, not reform. 1) It is specifically because of man’s value and dignity that we punish his moral wrongdoing. We don’t punish animals for stealing or killing (we don’t punish them, we remove them for our safety). 2) We hold men morally responsible because of dignity. 4) Arguably it is undignified to force rehabilitation on free moral agents who don’t want it. 1) The Catholic position against capital punishment is somewhat ironic given their position on purgatory, in which even when God forgives a sinner, still he must suffer for his own sins. 2) What of the practice of penance? ©1994 Gregory Koukl. Reproduction permitted for non-commercial use only. …that the debate audience had cheered and whistled the week before at the Reagan library. It happened when a questioner related that 234 death row inmates had been executed in Rick Perry’s gubernatorial tenure in Texas, far more than in any other state. The question to Perry, after the death glee subsided, was whether he agonized about any of that. He said no, not at all. How could he have dared to say otherwise? This is no time for a Republican presidential hopeful to stand before a contemporary conservative audience in America and go all wobbly on death and killing. Also I agree with Koukl that in the case of the Oklahoma City Bombing the murderer deserved to die. The same should be said about this case in Norway!!! People say, “Well capital punishment is just revenge.” My response is they’re right in a sense. It is revenge. In fact, it’s justrevenge. It’s God’s vengeance based on justice, executed through the machinery of government that God ordained. Where does liberalism lead? Look at Norway and you will see them letting mass murderers out in a few years!!! In Norway we read of Breivik and what he did at age 32 by killing those people in Norway and now we find out that this socialist country in Europe knows better than us and is letting mass murderers out in just a few years. The alleged mass murderer who killed nearly 100 people in Norway on Friday may be facing just 21 years in prison if convicted. Norway does not have the death penalty. Christie, however, said it is theoretically possible for the perpetrator to be held in prison longer than 21 years, though it almost never happens. Police are labeling the attacks as acts of terrorism, according to the Wall Street Journal. Breivik, 32, is suspected of being behind attacks Friday that killed at least 94 people and injured many others. A car bombing in the Norwegian capital of Oslo killed at least seven and a shooting spree at a youth camp on the island of Utoya outside of Oslo killed at minimum 87, many of whom were teenagers. Apparently, Jesse Jackson made some comments on “Meet the Press” this morning referring to the possibility of capital punishment for Timothy McVeigh. He said, allegedly, that executing McVeigh would just be a trophy that the people of Oklahoma City would like to get in their trophy case to make them feel better.Jackson should have been ashamed of his comment. To refer the punishment of a man who is a convicted killer of 168 citizens of Oklahoma City by those who are deeply interested in justice as simply a quest for trophies is an insult to every person who lost a loved one in that explosion. It’s an absolute insult, and it should be an insult to every clear-thinking American. Capital punishment is not about getting trophies in any trophy case, any more than life imprisonment is about putting man in a cage as a trophy in a human zoo. It’s about justice. What the people in Oklahoma City want– and all Americans who are in favor of capital punishment for a man who violently snuffed out the lives of 168 people– is not a trophy. They want justice. I’m actually stunned, to be honest with you, that there are so many Christians who oppose capital punishment on biblical grounds. It ought to be clear to anyone familiar with the biblical record that God is not against capital punishment. It was His idea. He started it.